Imagine the Manhattan Bridge twinkling from underneath with hundreds of small pods filled with decaying biomass – the final resting place of many former New Yorkers, shining like stars in an otherwise dark sky. There, you might lay flowers near a pod containing the remains of a loved one, until decomposition finishes its course and all that remains is a container to keep as a remembrance. This is the vision that is Constellation Park, a shiny new cemetery proposed by DeathLab, a trans-disciplinary research and design space at Columbia University. For the past five years, DeathLab has been focused—during an era of global warming, overcrowding and leave-no-trace environmentalism—on solving the problem of last rites in New York, where an average of 144 bodies stack up per day. That, in turn, totals around half a million plots per decade, consuming nearly all of the ground left in the dozens of cemeteries and polluting the air with cremation smog in the New York metropolitan area. It’s a lot of death, in other words, in a very small space, and how we’ll deal with it in the future is an open question (also explored by Hyperallergic in May). One thing’s for sure, though: it’s probably going to look a lot different than how we’ve dealt with it in the past. Which is where DeathLab comes in. In Bristol, England a similar project at the historic Victorian Arnos Vale cemetery won a prestigious design competition there earlier this year, allowing DeathLab researchers to work to build a design for a prototype. Here, the Manhattan Bridge project hasn’t even gotten that far along, but if stodgy old Britain can at least try, couldn’t New York? For now, the answer is no, as the idea has yet to even come before the city council, while also facing fierce opposition from the funeral industry. But like a lot of things in New York it might, eventually, come down to a numbers game: if built, Constellation Park, could accommodate around 10 percent of deaths in the city each year—a number that seems small until you start to think about the alternatives, which can be environmentally disastrous. But, like Constellation Park, the latter ideas have been met with obstacles: No commercial prometorium, or freeze-dryer, has yet been built. And although seven U.S. states approve of flameless creation, religious institutions, including the Catholic Church, have declared the disposal of liquefied bodies “undignified,” contributing to the demise of a 2008 bill that would have legalized alkaline hydrolysis to New York. Proponents of alternative means of dealing with corpses have said, however, that some religious institutions—and society itself—might have to rethink their burial dogma. “The ways in which a cultural group has disposed of the deceased – since almost the beginning of human history – has often been a matter of environmental necessity,” said Christina Staudt, a DeathLab affiliate and the Chair of the Columbia Seminar on Death. “In the high altitudes of the Himalayas, where permafrost makes the ground impenetrable, earthen burial and burning of the body are not viable options, and a tradition of feeding the corpses to vultures developed. Which brings us back to Constellation Park, which would in part be made possible through the work of Rothstein’s colleague Kartik Chandran, who has been working on an anaerobic microbial digestion for corpses in which microorganisms consume bodies without the need for oxygen, reducing them to light. Through that digestion, Constellation Park shines—and families wouldn’t have to, as Rothstein has put it, visit loved ones who lived in Queens for 85 years in New Jersey cemeteries 85 miles away. It also means that the future of death in New York might be bright—at least for the living. Mark Wagner makes currency portraits of Drumpf, Clinton, and more. 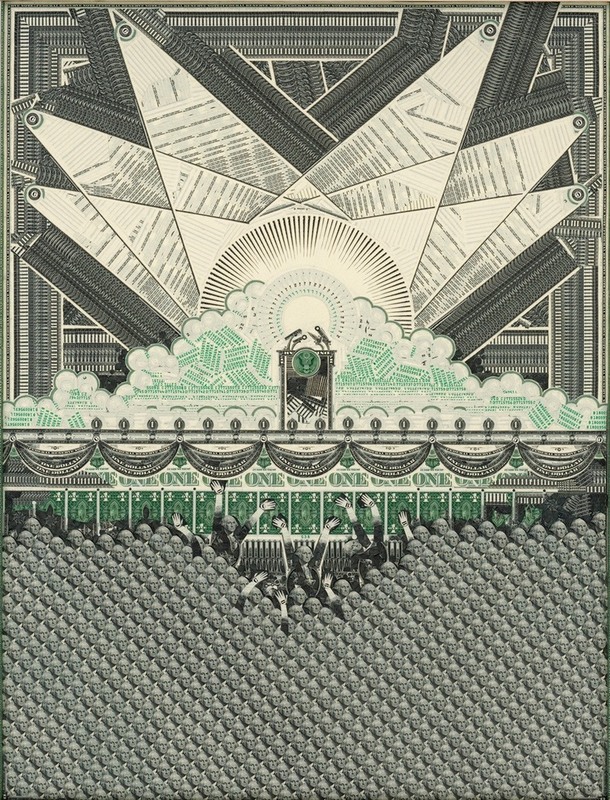 When the collage artist Mark Wagner first started creating his signature pieces, he faced every day with a significant decision: save that fresh stack of one-dollar bills sitting on his drafting table for his currency-based artwork, or eat heartily. But to Wagner, those thousands of bills were meant for more than just creature comforts. Soon he would slice them up into 25 of their individual components—George Washington heads, treasury seals, the various letters—and glue them onto sketches that skewered capitalism, or socialism, or both, making sure every last sliver was accounted for. His frugality paid off: last month, Wagner opened I’m Mark Wagner and I Approve of This Message at the Pavel Zoubok Gallery in New York City, just in time for the final stretch of the presidential campaign. In a conversation with Atlas Obscura, Wagner discusses the unique methods he uses to construct his currency portraits, from decapitating George Washington with a “Guillotine cutter” to the signature he takes special pains to avoid. How do you go about cutting the currency? There’s probably about a dozen different ways we approach a dollar for use… Sometimes we just shred the bills. Much of the time a bill gets sort of dissected into its constituent parts, separating lights and darks, preserving line work that might be used for “drawing” purposes, subdividing Washington’s face into cheeks, foreheads, necks… all of which have their specific uses. Most recently I’ve been cutting up a hundred bills at a time in a 19th-century Guillotine cutter that lets me slice like butter through an entire stack at once. Tell me more about your selfie still-lives. The design of the dollar bill hasn’t changed since, like, the 1950s, and even then it didn’t change that much. And there’s really not much to root my artwork in any specific time since then. So I wanted to do something super-contemporary. At the same time, the computer-ish things our phones are doing is also changing the nature of money. And vanity and money don’t have anything to do with each other… right? There’s a lot of symbolism in these pieces. Does that cohere after construction, or is it planned before? It's a mixed bag as far as the symbolism goes. Some of the pieces are obviously very heavy-handed with their commentary. But some of the work is just pretty. I don't fret too much over it. Do you use every piece of the dollar bill in your work? There are pieces that fall out of favor. I've been avoiding [former U.S. Treasury Secretary] Timothy Geithner's signature for years because it's ugly. I've got a bag that must have like, 2,000 of his signatures, but it's still only a tiny bag. As the U.N. Security Council wound down its quarterly debate on the Middle East, during which Secretary-General Ban Ki-Moon unleashed a new round of scolding on Israel and Palestine for their protracted peace stalemate, worker bees down the hall at the U.N. Delegates Lounge silently arranged armchairs and tables in preparation for the monthly jazz concert. Around 6 p.m., the booze-ready U.N. proletariat began arriving. At 6:30, the football-field-sized room on the edge of the East River was a tenth full. Fifteen minutes later, most of the good seats had been taken, as bar-backs whisked a cart of booze past security guards manning a glass turnstile, opened only with a tap of the right ID. By the time Finn Summerell, chief of the U.N. Yearbook Unit, pulled out his guitar and led his troupe of professional editors in a spirited blues number at 7 p.m., the room was completely full. At the bar, a long-haired, bearded bartender poured pints of Rockaway Brew Company’s ESB–the Delegates Lounge beer of the month. “During the day, it’s a very calm place to have a coffee and negotiate. At night, it’s a fabulous environment to meet and talk with everyone–all the U.N. entities,” says Stefan, an officer with the Department of Peacekeeping Operations (DKPO). “Some days, when it’s your job to help achieve the mandate of peace on earth, it’s a requirement to come down, look at the art and relax." For a few years, however, the fate of the Delegates Lounge hung in as much balance as any country under the official U.N. Charter. When the U.N. finished its comprehensive, five-year, $1.9 million renovation in 2013, it considered keeping the lounge closed. The room was a midcentury modern throwback to the Mad Men-era days of unencumbered drinking and smoking at the office–replete with period tapestries, including a 617-pound, 32-foot arras of China’s Great Wall from 1974. Moreover, it encouraged bad behavior, some diplomats said, and they didn’t want to pay for it. Redecorated by Rem Koolhaas at the behest of Queen Beatrix of the Netherlands, the lounge elicited fresh hope of rubbing elbows with the world’s most influential people and offered spectacular vistas of eastern Queens–or “the airport terminal in Amsterdam” as one DPKO official said about the new decor. But the people came in droves, with Friday nights bringing more and more employees and their friends to mingle alongside the 11th-century Surya Sun God, a 1982 gift from Indira Gandhi, or, at one point, the 2001 Nobel Peace Prize. In lieu of the old-school honor system, guards began to issue guest badges to be worn around the neck. With the new passes, came a new rule: no more than four people per employee and only on Fridays. “Do you know how many important people and decisions have been made here?" Nadir Dirar, supervisor of Arabic Editorial and Desktop Publishing, asks rhetorically. Many indeed, including Vladimir Putin and Barack Obama’s grudging agreement to shake hands and get along last September. “It’s a historical spot, not just a room, and one of the most awesome ones at that,” says Dirar, a native of Sudan, while sipping a glass of clear liquid. Toward the end of the 70th General Assembly in December, however–after three months of delegates continuing to break guest rules, of interns drinking too much, and of everyone getting too busy on the dance floor–another Delegates Lounge resolution was passed: two guests per staffer, no interns without a Secretariat ID, and no DJs on Friday nights, unless someone was hosting a party. For their part, U.N. workers are supposed to have better nightlife options than just hanging out in their admittedly fabulous office watering hole (or the faux-Irish bars dotted along Second Avenue). “If you spend too much time at the DL it means that you have nothing better to do, which is quite sad,” says a political affairs officer. The “Wildwoods Shore Resort Historic District” of New Jersey—known as the “Doo Wop Motel District” to locals—lies primarily along a two-mile stretch of beach in Wildwood, New Jersey. Visitors to the town will find the largest concentration of mid-20th-century commercial motels, called Doo Wops, in the nation, each featuring its own fantasy theme, eye-catching sign, vivid color palette and kitschy ornaments. Up until the late 1990s, nearly 100 motels stood within this district alone, virtually untouched since their original construction in the 1950s and 60s. From 2003 to 2006, unchecked real estate development in the area led to the demolition of several notable motels, including the Satellite, Kona Kai, Fantasy and Rio. Now many of those same tourists stay in new Mediterranean-style compounds from Memorial Day to Labor Day, as the Doo Wops have lost a bit of luster. A few years ago, Wildwood undertook three initiatives to bring vacationers to the town all year round, but aside from the fall Boardwalk Classic Car Show, the Irish Festival and Seafarers Weekend, they have so far been met with scant attention and even sparser turnout. While the economy may roar through the summer, in the winter, it sleeps. In January 2015, the unemployment rate hit 17.9 percent before it fell to 6.4 percent by August, although the county’s tourism industry drew $5.8 billion in spending last year—New Jersey's second-highest county total. Still, as year-round tourism wanes and the baby-boomers age, jobs become more elusive and historic buildings become more difficult to maintain. The Doo Wop way of life dies a little bit every year. The following photos, shot by Raphaelle Guillon in the height of the 2015 summer season and over Thanksgiving weekend that same year, illustrate Wildwood’s spectacular rise in the years after World War II—and its gradually diminishing glory. During the summer, Romeo’s Pizzeria on Pacific Avenue, serves pizza from 5 p.m. to 5 a.m., specializing in slices for the sauced since 1975. Last September, Wildwood’s tourism board dedicated the 12-by-40-foot “Twist Again” mural in Romeo’s parking lot to Chubby Checker, who first performed his iconic dance at the Rainbow Club in 1960. During the winter, its pink-flamingo sign offsets the Caribbean Motel, built in 1957 by Lou Morey—of boardwalk attraction fame. Among the signature features of the once ultra-modern motel are a curving “Jetson Ramp” that winds its way from ground level to the second-floor sundeck and crescent-shaped pool. An Asian elephant stands waiting for passengers outside the drained pool of the Singapore Motel on the Wildwood shore. Designed to look like a 1960s South Asian pagoda, the Singapore has a mixed reputation, despite the laughing Buddha near the beach entrance. A statue of the Virgin Mary stands guard over the recently renovated Blue Marlin motel. A staple of the area for nearly 50 years, the Marlin suffered from noisy guests and outdated amenities until Mary came along with new ownership. A plastic owl watches sun-bathers at a motel near the beach in Wildwood New Jersey, September 2015. A closed Beach Taxi stand off the boardwalk of Wildwood, New Jersey. In the summer, John Deere gators take tourists and their things to any shore spot, including Morey’s Pier Waterfront Park, for $3 one way. Wildwood's beach is estimated to be as wide as 2,000 feet in spots.